You are probably wondering why I didn’t put this one under beef. Well the answer is simple because I used three different cuts of meat. Beef, Turkey and Pork. The meatloaf has European origins; meatloaf of minced meat was mentioned in the famous Roman cookery collection Apicius as early as the 5th century. 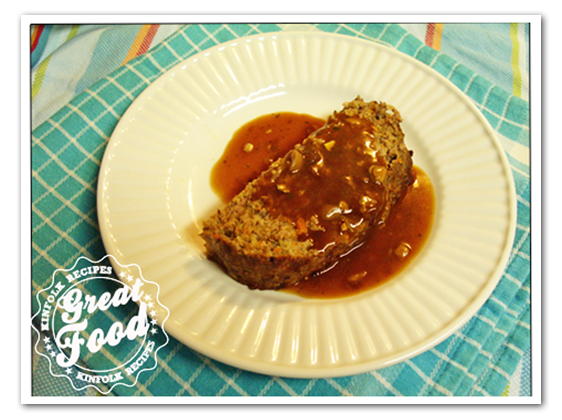 Meatloaf is a traditional German, Belgian and Dutch dish, and it is a cousin to the Italian meatball. American meatloafhas its origins in scrapple, a mixture of ground pork and cornmeal served by German-Americans in Pennsylvania since Colonial times. 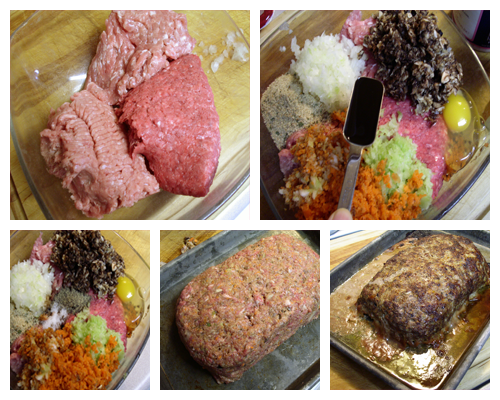 However, meatloaf in the contemporary American sense did not appear in cookbooks until the late 19th century. In 2007, meatloaf was voted the seventh favorite dish in the United States according to Good Housekeeping. During the Great Depression, cooking meatloaf was a way to stretch the food budget for families, using an inexpensive type of meat and other ingredients as leftovers; along with spices, it was popular to add cereal grains to the meatloaf to stretch the meat. The tradition lives on with the merits of producing a lower-fat dish with superior binding and consistency. The meatloaf is typically eaten with some kind of sauce or relish. Many of these recipes call for pasta sauce or tomato sauce to be poured over the loaf to form a crust during baking. The tomato-based sauce may be replaced with simple brown gravy or onion gravy, but the meatloaf is prepared in a similar manner. Barbecue sauce, tomato ketchup, or a mixture of both tomato ketchup and mustard may also be used. American meatloaf may be garnished with ketchup. Another variety of meatloaf is prepared by frosting it with mashed potatoes, drizzling it with a small amount of butter, and browning in the oven. The meatloaf is normally served warm as part of the main course, but can also be found sliced as a cold cut. 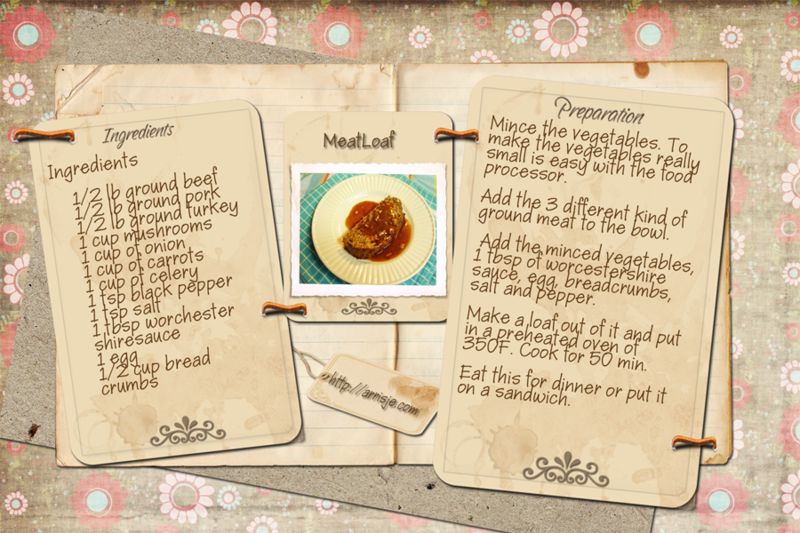 Meatloaf can also be considered a typical comfort food and is served in many diners and restaurants today. This info found on wikipedia. Mince the vegetables. 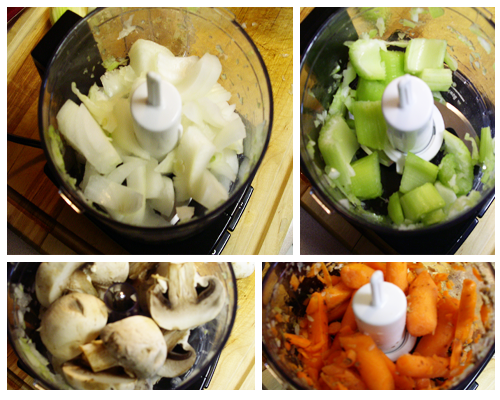 To make the vegetables really small is easy with the food processor. Add the 3 different kind of ground meat to the bowl. Add the minced vegetables, 1 tbsp of worcestershire sauce, egg, breadcrumbs, salt and pepper. Make a loaf out of it and put in a preheated oven of 350F. Cook for 50 min. Eat this for dinner or put it on a sandwich.